VR CPR is a Virtual Reality experience, designed to provide an immersive training environment for healthcare professionals and lay people. Perform BLS or BLSD and train your skills in three different scenarios: in-hospital, out-of-hospital and pediatric. Our software is compatible with HTC Vive system, which features the innovative room scale tracking technology. This device allows the users to freely walk around a play area, with their real-life motion reflected in the VR environment. Thanks to two infrared tracking stations, the VR system monitors the user's movement in all directions, and translates this into the virtual world in real-time. This allows the player to perform tasks, such as walking across a room and pick up an AED, using natural movements. 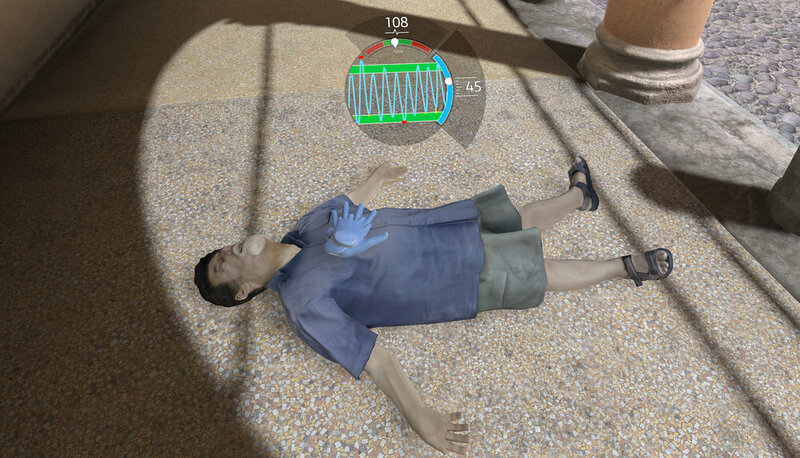 In order to include in the virtual BLSD procedure a realistic CPR performance, we have decided to not use the classic HTC Vive controllers, opting for the more recent trackers. By using a dedicated wearable on each user’s arm, we are able to replicate his movements while letting him free to place the hands in the correct position during chest compressions. 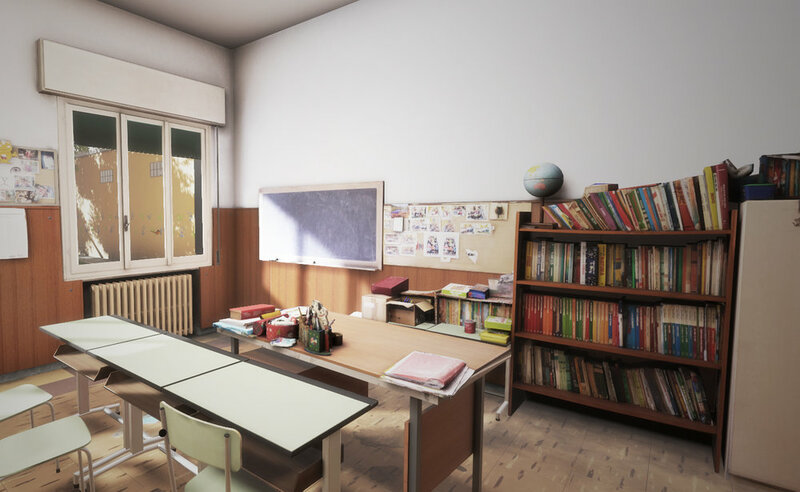 Another essential aspect for virtual simulation is the photorealism of the 3D environments in which the user lives this experience. Human and location models and textures has been acquired through the photogrammetry process. Thousands of pictures has been taken and processed by dedicated tools, in order to recreate the virtual equivalent of real-life people’s and places in a faster and reliable way. 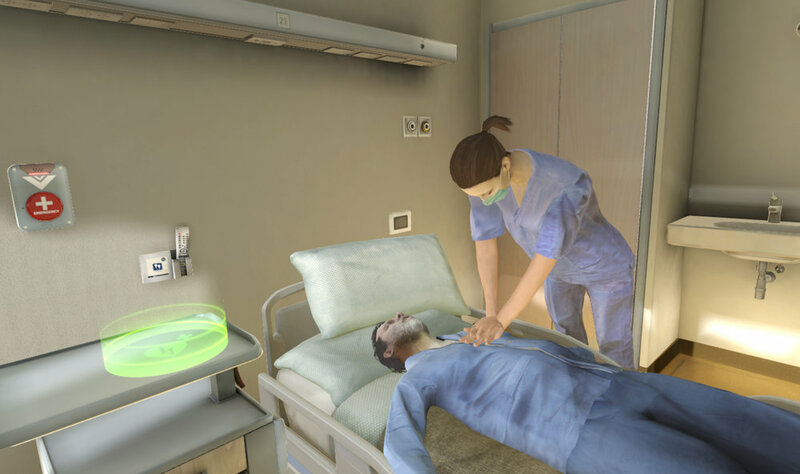 In addition to the heart attack victims, each scene includes the presence of virtual characters that will support and interact with the user during his experience. Their animations have been recorded in motion capture, and then edited and polished to fit virtual models while maintaining realistic movements and behaviours.